Though Facebook CEO Mark Zuckerberg did not mention Apple during a congressional hearing concerning data privacy and social media matters on Tuesday, a photo of his prepared notes shows he was ready to drag the iPhone maker into the discussion. Following today's testimony, a photo showing two pages of Zuckerberg's printed notes circulated around the web, revealing the CEO was prepared to delve into areas that went untouched during the hearing. Notably, the Facebook chief was ready to defend Facebook's business model in light of disparaging statements made by Apple CEO Tim Cook last month. The first entry in a section titled "Tim Cook on biz model," apparently prepared in case Cook's comments were broached, Zuckerberg first refers to a quote from Amazon founder Jeff Bezos. An abridged version of Bezos' remarks, made in reference to a recent Amazon Kindle release, the notes read, "Companies that work hard to charge you more and companies that work hard to charge you less." The missive is an apparent defense of Facebook's revenue model, which goes against the grain of traditional payments for products and services. Zuckerberg recited the same passage to Vox in an interview earlier this month. "At [Facebook] we try hard to charge you less. In fact, we're free," Zuckerberg's notes read. Comparing Facebook to Apple, which often touts itself as a bastion of user privacy and data security, Zuckerberg's notes say the two companies' policies are "similar." He relates installing an app on iPhone to users logging into Facebook -- both request access to certain information that can, in some cases, be sensitive. Zuckerberg also claims there are "lots of stories about apps misusing Apple data," though he never sees the company inform its customers of such events. It is "important you hold everyone to the same standard," Zuckerberg concludes. Business Insider reported on Cook's inclusion in Zuckerberg's notes earlier today. At the China Development Forum in March, Cook responded to questions concerning Facebook's fiasco with Cambridge Analytica, a political data consulting firm that gained unauthorized access to the personal data of some 87 million users. Cambridge Analytica provides advertisement targeting services, which could have been used to sway the political sentiment of American voters prior to last year's presidential election. As in past statements concerning free-to-use services, Cook inferred Facebook's advertising-based model makes customers the product. He echoed those sentiments in an interview aired on MSNBC last week. "The truth is, we could make a ton of money if we monetized our customer -- if our customer was our product," Cook said. "We've elected not to do that." For the most part, Cook declined to address Cambridge Analytica directly and instead offered broad statements on the larger issue of data privacy. As for government oversight, Cook said the "best regulation is no regulation," but conceded recent events warrant a stricter approach. When asked how he would handle Facebook's problems, Cook said he "wouldn't be in this situation." Zuckerberg later called the argument and Cook's statements "glib." Zuckerberg is set to conclude his visit to Capitol Hill on Wednesday with a second day of testimony in front of the Senate Commerce and Judiciary committees. Facing a specter of new legislation that would regulate how tech companies handle user data, the Facebook CEO apologized to Senators for mismanagement that led to the Cambridge Analytica scandal and promised steps are being taken to enhance user privacy. Do you think Zuckerberg feels like his privacy was violated or was this an intentional leak? The media covers this moronic non-story that is a bunch of politically overblown hype, meanwhile Congress has done exactly nothing over the Equifax hack which affected half the country in a very real way. Insane idiots all of them. Across the board Term Limits now! Zuckerberg is one arrogant prick. The people are trying to hold Facebook "to the same standard" as Apple, but I'm afraid the politicians have all already been paid off. That's because Equifax knows who to grease. The difference between data collected by Apple and the data collected by Facebook is Apple's data collection is anonymous and not traceable to a single person. Facebook can tie the data to a specific person. Ah, the old “Red Herring” gambit. The problem isn’t what other companies are doing, Zuckerberg; the problem is you. This is like someone borrowing a friend’s car then leaving the keys in the ignition while they head into Walmart to buy beer. When their friend asks how the car was stolen, his idiot mate crushes an empty can against his forehead and points out that the Amish don’t have cars. The Consumer Financial Protection Bureau is running that investigation, but these days it's being run by its biggest critic, and has completely stopped all actions. Its head, Mick Mulvaney, requested a budget of $0 for the agency, which returned about $12 billion to consumers for illegal and fraudulent activities in 2016. It's absolutely shameful that Congress let Equifax off with a slap on the wrist, all the while they did far more damage than Facebook could ever do. There was a part of me that was hoping that Zuckerberg would mention Equifax to Congress to shame them but that wasn't going to happen. This was just a pony show to make Congress look like they were actually doing something. They're making it sound like Facebook was sharing my ATM Pin, Birthdate, SSN#, and bank account numbers, when all they really know about most people is what kind of cute kitten videos we've seen. I really don't care. So with that, I did the only thing I could think of. I bought Facebook stock today just because I knew a bargain when I see it. So while congress is busy playing with themselves and shaking each other's hands... I'll be going taking my winnings to the bank. Total dog & pony show. We already knew Zuckerberg was a total douchebag. This hearing was more like an initiation ceremony to welcome the Zuck into their club. more like the cost = my privacy. Facebook is like google. Supported the same way. There is only one way to push ads that are “relevant” and that is to invade someone’s privacy to make the user the product. Of course the guy wants to spin. He doesn’t have a product to sell the user. Only a service that not many would pay for. So he made the. User the product to sell too advertisers. So his words against apple were best not used because he’d look like an imbecile who doesn’t understand business. Apple doesn’t have to sell users as products because it sells it services and actual products as products. Zuckerberg is just mad because nothing has changed. It’s the same as it was back when Steve jobs figured opus that people are willing to pay for outstanding products and services. Back then, “free” stuff was invading your privacy and turning you into ad revenue for them. It’s the same now. Hey Zuck, care to share where you stayed last night? What's that? No, you aren't? You failed Zuck. Why do you expect your users to do stuff that you won't do eh? Hey, Justice, where's the order sending Facebook into Chapter 7? I'll sign it now. 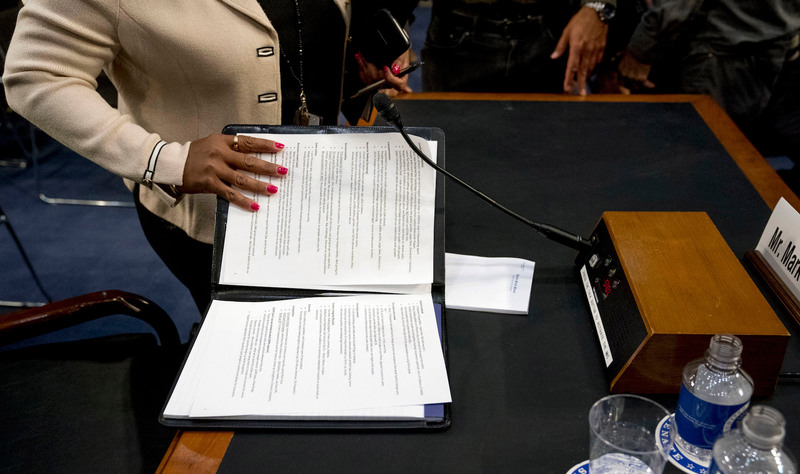 I’ve always felt Congressional hearings were nothing more than Congressional photo ops: producing little in the way of beneficial legislation and always positioning the politician as being on the right side of an issue (no matter his feelings on the subject). ...and their family, their friends, their partner(s), people they work with current and past, everyone they went to school/college/uni with and ALL of those people's data and their friends lists. Epic data. Same old, same old. A sleazy a**hole with a company created in his very own image. Zuckerberg is off the charts on the slimely sleazy scale that it beggars belief that anyone would support him by giving away their personal information and/or to even believe a word he utters. So he’s apologising but still thinks he’s right. Which is it Zuck. He’s extremely arrogant. I'm not a USA citizen so just interested to read about the negative views on congressional hearings generally from several other contributors rather than specific discussion about privacy breaches. What I take from the posts is that there is a bunch of senators on one side of the 'table' that are calling out the 'contrite' person sitting on the other side of the table (but everyone knows which side of the table has the real power). Years ago, arguably the most powerful man in Australia, media mogul Kerry Packer was in the spotlight for the tax practices of his company, Australian Consolidated Press. MPs could hardly contain themselves when they finally managed to get him to appear before a parliamentary committee (equivalent of a congressional committee). Mr Packer stared down committee member after committee member. Not much about the tax practices of Australian Consolidated Press was elicited except Mr Packer's now infamous statement that "of course" he tried to pay less tax. "I don't know anybody that doesn't minimise their tax. I'm not evading tax in any way shape or form. Of course I'm minimising my tax. If anybody in this country doesn't minimise their tax they want their head read. As a government I can tell you you're not spending it that well that we should be paying extra." I still think that old media has far more power than FB, which is basically a collection of people individually posting stuff. Yes the data breach was bad, but CA had no measurable or provable influence on the election or Brexit. In fact the war against FB is part of a larger war against non MSM opinion in the West. A war against the internet in general.